I have a confession to make. I LOVE youtube. So ? Whats so great about it, you ask ? Everyone loves youtube. Well, yes and no. Everyone likes to spend time on youtube, watch a dozen videos everyday and then move on. I, on the other hand, actually like some of those videos enough that I like to take them with me and play them back on my iPhone/iPod video. Unlike some other video sharing sites, though, youtube doesn’t offer an easy way to download videos for offline viewing. There are a ways to download videos from youtube to your personal computer and then convert them to a format which the iPod can play back, but they’re all just inconvenient hacks. They work, but not if you’re in a hurry and are not really in the mood to play around with the countless options that tools like ffmpeg (which, by the way, is an excellent open source video converter) support. This is where ConvertDirect comes in. ConvertDirect is an easy to use and free online service for converting youtube videos to one of the many video formats it supports. Just enter the link to the youtube video and chose the format you want your converted video to be in. Type in your email address and ConvertDirect will send you an email with a link to the converted video. The link will be live for 48 hours during which time you can download the video from their servers. If you only want to use a desktop player like vlc to play back the videos offline, then click on the “Download the online video directly” tab and download the video to your computer. Converting youtube videos for offline playback couldn’t have been simpler and more convenient than this. Go ahead and download all those music videos great educational videos you’ve been waiting to watch and take them with you on the road. Are there any other great online-to-offline software that you guys use ? Cool websites ? Let us know in the comments. neat. exactly the kind of thing i’ve been looking for forever. spend long nights converting stuff for my pod’s. will give this a shot as soon as i get home. Ok, you have two options .. if you have access to a Mac, an application called senuti (itunes spelt backwards) can help you. Or else, copy the Complete Music folder from your ipod back to your computer and then import it into itunes … The files would have some cryptic names but this method will atleast get back your data. I don’t have my ipod with me right now or I would have told you the exact steps. Once you have the music on your laptop, you can ask itunes (there is an option somewhere for this) to rename them according to the id3 info. Again, will update you once I’m back at home. but i guess you can directly download onto your iphone ..i thought i saw a widget..
Youtube Converter – YouTube Video Converter is the most powerful product to get flv videos from YouTube.com and convert to other video formats. 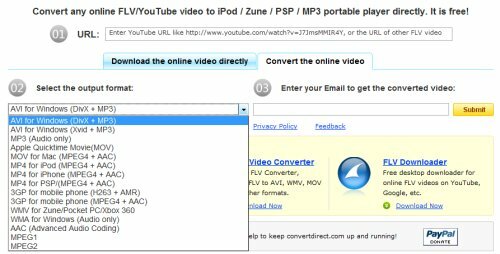 With its “downloading + playing+converting”, you could easily get FLV videos from YouTube to MP4 playing on your iPod, PSP, mobile phone, Apple TV, Zune, iPhone etc.